Last night I had a run in with a new kind of evil. A menacing scourge of the night made more wily by the fact that they’re intelligent little bastards. I’m speaking, of course, about the raccoon. One of the people following my blog had left me a comment last night telling me, among other things, that the raccoons in Florida were notoriously clever little thieves. I’d been really good the last few weeks about hanging my food from the poles located in each camp and so, in my hubris, I thought I was safe. Man was I wrong. 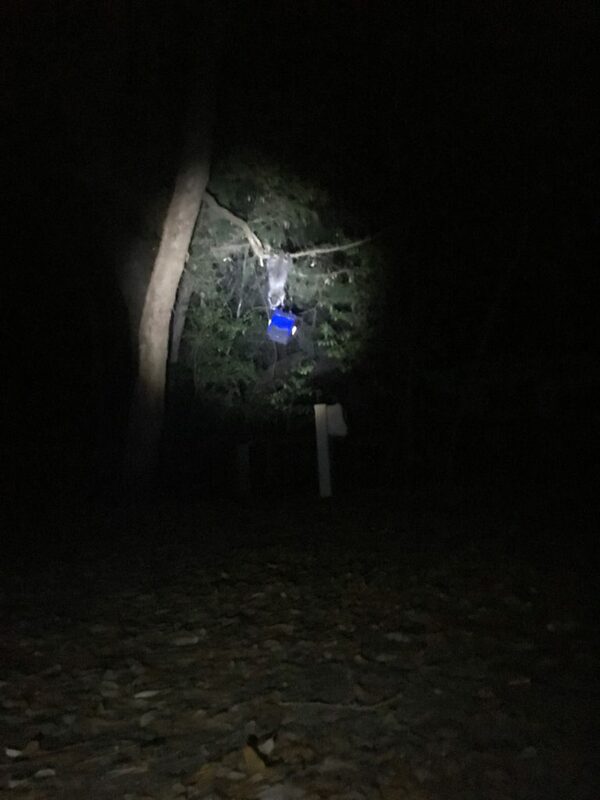 Not even 30 minutes after he’d warned me I shine my light towards a noise I heard coming from where I hung my food bag and there were 3 of the things climbing right up the pole and trying to get in! I ran over and scared them away and as soon as I turned around I saw another 3 climb up onto my picnic table and one of them swiped a whole bag of bagels. These guys had executed a perfect diversion tactic and were all probably munching away on my bagels in the bushes laughing about that stupid human. Fast forward to about 1230 AM. I’d hung my food in a better position and thought that it was finally raccoon proof. Not exactly. I hear a scuffling sound coming from the tree where my food was and when I shine my light I see the little thief performing some Cirque du Soliel level gymnastics, hanging upside down from the tree by his little hind paws trying to score some more grub. I barrel out of my tent and give him an angry shot from my water bottle to scare him off. Then I do the only other thing I can think to do. The most base, animal-level intruder defense. I pee all over the tree, hoping my alpha-bro man scent will keep the beasts at bay. Nope. Not even 5 minutes after I lay down he’s back, probably covered in pee and laughing at my feeble attempt to thwart him. I ended up just bringing all of my bags into the tent with me and that seemed to do the trick. For now. The rest of the day went perfectly. I popped into the grocery store to resupply, got a sandwich and headed the 20 or so more miles to today’s campsite. I stopped in at a little bike shop along the way to see if they could help me out with the fit of my bike. My elbows have started hurting a bit more at the end of the day and I wanted to see if they could recommend anything. They swapped the piece that connects my handlebars to the stem of my bike for a shorter one and it seemed to do the trick. Thanks guys!!! Well it’s time to go jump into the ocean and relax. 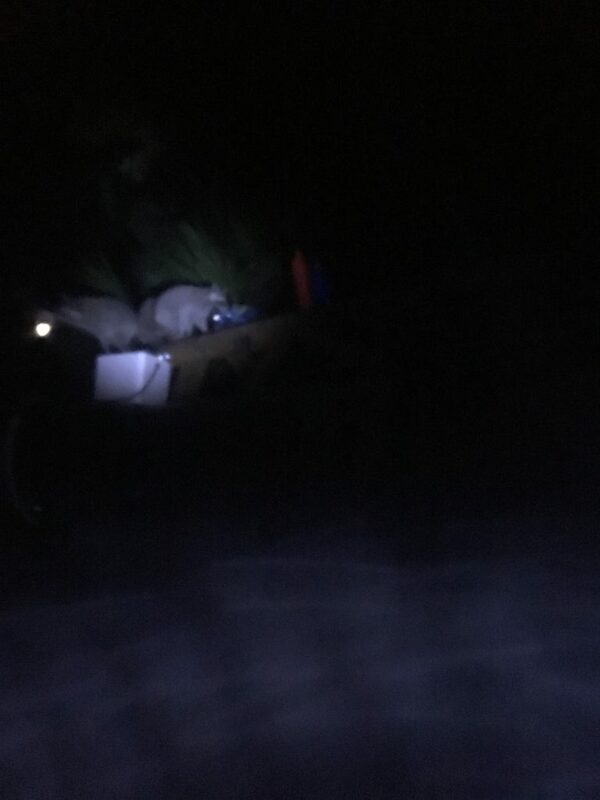 Hopefully no more raccoon trouble tonight! Stay tuned for the next edition of James and his Bike! A man, known locally as ‘barefoot’ stole a forklift from behind a local walmart after its operators left for a break leaving the keys in the equipment. I like his answer. I feel as if that’s the best possible answer he could have given ?? ?